There is nothing like creating memories with traditional recipes , like the special dishes that mom and grandma makes ; especially when you miss home and your parents the most ! Yeah I miss my mom , my dad and you my dooda! You know what I do when I wanna recharge my batteries and give an emotional break? I try to recreate the smell and flavor of Ammachi's and Amma's kitchen ; this time Amamchi's special slow cooked naadan beef curry won the toss. Its been so long since we made beef , cos of the healthy diet regime I was blah blah-ing about in last two posts . So the making of this curry was exciting to my taste buds and emotionally enticing ! 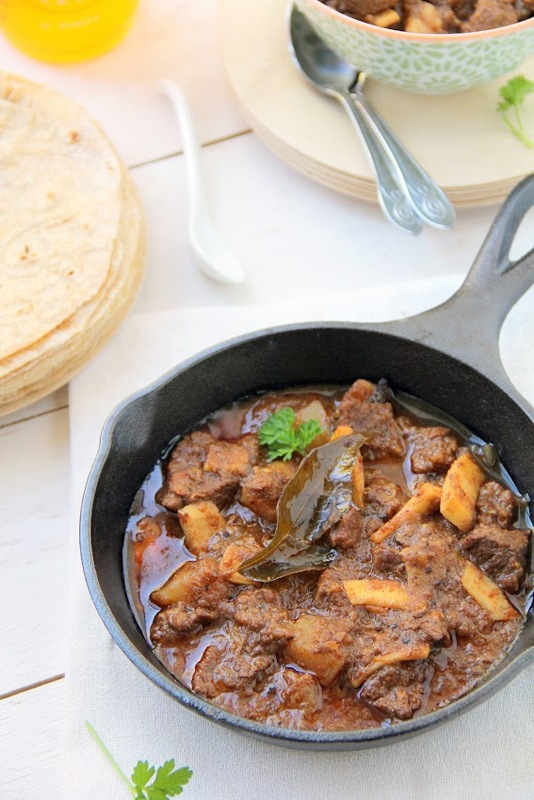 What's special about Grandma's Beef curry , you might think! Well , she makes it in the old fashioned "Aduppu" , in a wide mouthed Manchatti - Clay pot , and slow cook it for 1.5 to 2 hours. The smoke , the uniform heat and the clay pot imparts a unique flavor to the dishes , making it the best est ever and the hardest one to replicate. 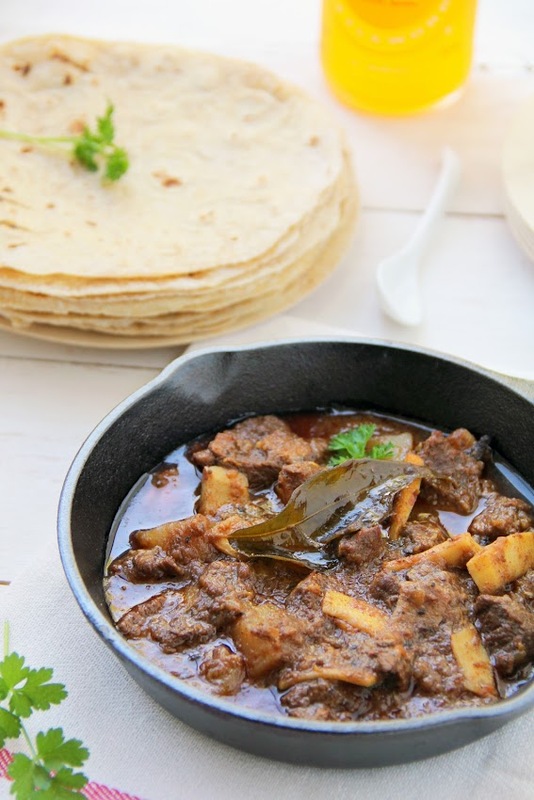 Don't forget the fact that this kind of "slow cooked in manchatti" beef curry is widely popular in the ubiquitous Thattukada( street stalls) and Chayakada( Tea shops) , accompanied with hot hot kerala parotta , back in Kerala. When my mom said she made it last day , it triggered my lust for the best and I badly wanted to dive into the comfort of those succulent meat rich with intense flavors. Since making this in the traditional Aduppu was simply out of the question in my smoke detector filled house, I tried to imitate it in the best possible way I could. Bake it , just like we make the classic American or Irish Beef stew and use the same cast iron cooking pot to retain the heat...I reduced the qty of spices from grandma's original recipe since i cant handle that much heat now , after 3 plus years of living away from home. The result ,amazingly delicious "melt-in-the-mouth" beef, bursting with flavors,; with a grin, close to my Kuttanadan grandma's. 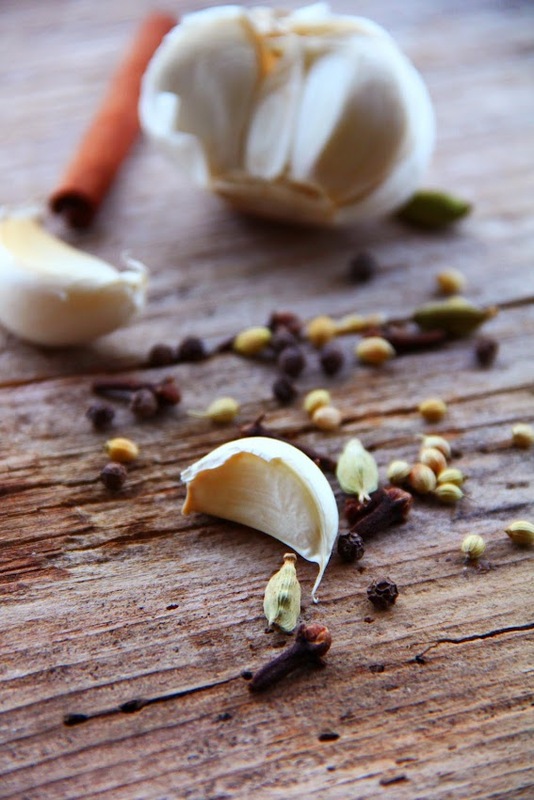 Lightly crush - 3 cloves of garlic , a small piece of ginger and 1/2 to 1 tea spoon black pepper ,in a mortar and pestle. Coriander powder - 1.5 to 2 tablespoon or as per your taste level. Clean and cut the beef into 1 inch pieces. Rinse well , till the water runs clear . Marinate the beef cubes with all the ingredients in Bowl 1 and keep aside for at least 30 minutes. If keeping for more time , refrigerate it. 2 ) Add fennel seeds , whole spices and curry leaves, fry for a minute or two. 3 ) Add chopped onion and saute for 5-7 minutes , add ginger and garlic and saute till brown. 4 ) Slide in coconut cuts and fry for a couple of minutes and add chopped tomato and saute for 2 minutes. 5 ) Add chilli , coriander and garam masala powder ,and the marinated beef ,cubed potato, combine everything well and saute for 3-5 minutes. 6) Add 2 to 3 cups of water( depends on your cooking pot) , bring to boil and let it stand on medium flame for 10 minutes. Stove top method :- Let it cook covered for 1 hour in a low-medium flame , giving one or two occasional stir.Uncover it check water and add more if needed and add 1/2 tea spoon crushed black pepper. Cook it again for another 30-45 minutes in low flame, checking in between for salt and water. Remove from heat and let stand covered for 15 minutes before serving! Pressure cooker method:- Add only a cup of water or less and pressure cook for 3-4 whistles or more depending on your cooker. Uncover it , add pepper , salt and water if needed and cook on low flame for another 20-30 minutes . Oven method:- Preheat oven to 350 degree F , while you start cooking. Increase the temperature to 375 degree F .After boiling for 10 minutes in Step 6 , transfer the oven proof cooking pot to the oven and cook covered for 1 hour ..( Don't forget to cover it with the lid).After 1 hour take it out , give a salt check , add 1/2 tea spoon crushed black pepper , add 1 more cup of water if needed and return to the oven and bake for another 30 minutes or until its is soft . Remove from oven and let stand for another 15 minutes before serving. Know the strength of your gas flame , before making this and adjust the cooking time thus! Using heavy bottomed cooking vessel is very important for slow cooking , else the water will be absorbed fast. Check for water in between to avoid curry sticking to the bottom! I made in a cast iron cooking pot or Dutch oven which can be used both in oven and stove top! 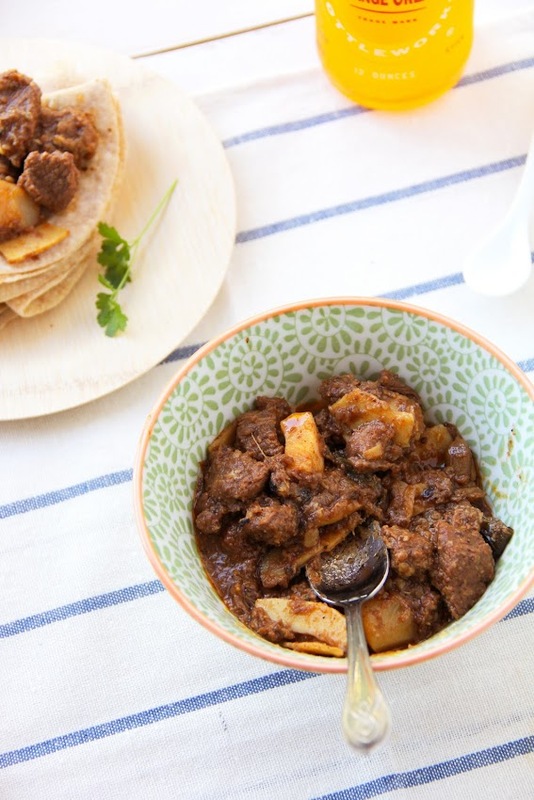 Add spices as per your taste and the recipe calls for medium spicy beef curry. Wow this looks amazing, takes me back to when I was in Kerala! Even though I don't eat it...i feel like drooling seeing the picture. Its cos of ur magic shots :) gorgeous pictures. Will try this one soon!! Oh,the clicks are simply superb Sarah..Yes,it's the most beautiful experiences on earth how delicious food can bring back a person,memories..I loved the entire write up Sarah. Being a vegetarian I would not eat this but the clicks are so eyepleasing I love what I see here. Wow!,Luv to grab that bowl dear.Ur Grandma's recipe is too good to make my tastebuds wet.Infact,I started having beef 8 yrs ago,When I was recovering frm Fever,my husband bought Kerala Beef Fry from Lulu Hypermart in Dubai.The next day I became Energetic and started keeping fine.Whenever I need an Energy Booster,I go for Beef Curry or Fry.Next time will surely try this Granny's spl Beef Curry.Thanks for sharing it. mm mouthwatering recipe...try with chicken or mutton!! I am not much of a red meat eater,but I can still vouch for this recipe as it is done every bit in the old traditional way and these cast iron cooking pots which weigh a ton are the best when it comes to substituting the clay pots:)I would love to try this recipe with chicken,it sounds and looks so luscious:)!!! kidilam!!!! it looks soo yummm!! !Another must try!! No words to express ..looking soo tempting..
wow! you actually took the pains to explain how to cook this in different ways!the curry looks so very delicious! Oh my..Sarah..Loved this recipe and the way you have presented it in such detail. I like the slow cooking method as I feel its the best way to cook to get all the spices absorbed.Snaps are superb!!!!!!!!!!!! And loved that cast iron skillet ;) I am a big fan of it and use it often at home whether it is fo Dosa or frying or making appams. one of my favourite beef preparations though have never tried the slow cooked method before! im craving for some now..
More than the dish, I fell in love with your grandma... but seriously this dish just made my heart beat to 100! what an amazing authentic curry.. Loved your idea of cooking it in the oven.. The beef curry looks super delicious..
What can I say! everything about this post is so homely and warming..:) No wonder you are emotionally connected to the taste of this beef stew ..:) Even by looking at the pics I can see why..
mouthwatering beef curry! great combo with chapathis...! i like your food pictures and want to invite you to try out tastingspot.com. it's for anyone that just wants another place to submit photos and share it will other foodies. It’s still in beta version, but would love for you to start adding some photos and help get it going. Gee! I don't even like curry but I have to say this sounds like a winnder! It will be made this weekend while my family is visiting! I made this last night for my carnivorous husband, and he absolutely loved it! The dish not only smelled amazing, it tasted soooo delicious. I did use the spicier adjustments and cooked the beef in the oven using my clay pot. I was always nervous about cooking beef, because it would get tough. But this was perfectly tender :-) thanks for sharing your recipe. Next time I'll try making it with your garam masala recipe. Tried this recipe today & it came out very well.... I used a "man-chatti" & slow cooked it over gas. Yr pics are a treat. Great job & thanks a lot. Hey Rekha..so happy to hear you tried and liked it ! Good to hear that u tried and come out good :).. Thank you once again....U are doing a real good job..
We are a bunch of bachelors from bangalore ... and from past three weeks we had been trying out your recipies on weekends. Must say you are good in what u do. The recipies are simple and easy to cook. Btw Grandma's beef+potato was awsome. Thank you for this initiative. Made this today in pressure cooker..and it's awesome with the aroma and flavors of the spices.